Berkeley, CA â€“ 16 November 2011—This February, Image Comics and Shadowline will proudly present a new ongoing series from Kurtis Wiebe, the writer of the critically acclaimed GREEN WAKE and THE INTREPIDS, and artist Tyler Jenkins. PETER PANZERFAUST is a high energy action story with heart, blending the unlikely combination of the wartime camaraderie in films like Red Dawn with themes from the beloved classic children’s story Peter Pan. To get a sneak peek of the first five pages of this exciting new series, readers need look no further than in the back of Nick Spencer and Joe Eisma’s MORNING GLORIES #14, which goes on sale in stores today. 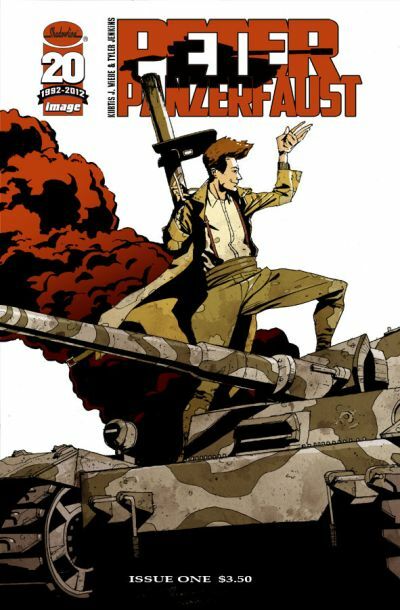 PETER PANZERFAUST is set in the city of Calais, the first city in France to fall to the Germans in the spring of 1940. A mysterious American boy named Peter rallies a handful of plucky French orphans, and they must work together to survive Europe’s darkest hour! PETER PANZERFAUST #1, a 32-page full-color action and adventure comic book for $3.50, will be on sale in stores and on digital platforms on February 15, and will be available for order now in the December issue of Previews.